Foundation - 17 Miracle Matte in Fair. 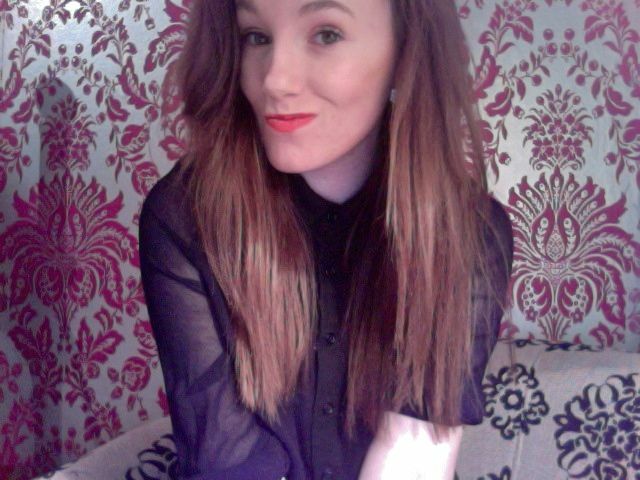 Lipstick - Topshop Infrared. Mascara - S&G Thick & Fast. Bronzer - Benefit Hoola. I never post photos of myself on ma blog. So I figured a goofy FOTD would suffice. I met up with all my friends today. I rarely get to see them cause they're in college (Uni for you UK peeps) and I am not. August cannot come fast enough. So I can find out if I got what I wanted. Some of you may remember that I was in college till November but hated it sooo much that I left and reapplied. Fingers crossed ay? We just mooched around drinking coffee in the rugby club, frappes in Esquires and grabbing an apple pie in Mc Donalds. Going to relax with a Lush bath and my 'Brothers and Sisters' boxset. Super excited to try out 'Phoenix rising' it smells so good. I left college the same as you did and was left waiting, its horrible but i'm glad I left. Soo excited for The Hunger Games. Cute photo :) sounds like a good day!